Take a break from the busyness of life with Inkspirations for Women, a captivating collection of exquisite original art from Judy Clement Wall. Whether you are new to the coloring craze or a gel pen aficionado, Inkspirations for Women will help you relax and unwind while unleashing your creativity with this eclectic mix of designs to color and customize. From nature scenes and floral designs to animals and meditative mandalas, each page offers a welcome excuse to take meaningful time for yourself while creating stunning works of art to keep or to share. The world is your canvas--go ahead and make some beautiful marks! it is up to us to paint a beautiful picture. Welcome to Inkspirations for Women! I hope from my heart that you'll enjoy this book and find that it's a place where you can relax, recharge, and renew, as you let go and let your creativity flow. As kids, many of us enjoyed coloring. Remember how that big, yellow box of crayons could captivate our imaginations for hours? When we entered the adult world, we most likely traded our carefree doodling for crossing items off our long to-do lists. But as adults, we need time to play, too—to nourish our hearts and renew our spirits, and that's what this book is intended to do. Do you sometimes feel like your whole day is devoted to taking care of the needs of others? You're not alone. When you feel this way, it's time to give yourself a break, nurture yourself, and let your mind relax in an expanding swirl of colorful patterns and designs. True happiness comes from the inside, and we can miss it if we're constantly focusing our attention outwardly. For all the giving and guiding women do, we sometimes need a quiet, simple activity like coloring to let us rest in a place of ease and creativity. Some people call it a state of 'simple awareness,' a state that's nourishing to the mind and heart. While researching my book Happy for No Reason, I interviewed some of the happiest people in the world, and discovered one thing they have in common is that they all take time for themselves on a regular basis. Many of them practice some type of relaxation or meditation daily. I was excited to learn that, according to recent research, coloring can wonderfully accomplish both of these. Yes, believe it or not, scientists have studied coloring, and they've found that it quiets your mind, calms your thoughts, reduces stress, and allows you to simply be. Research shows that coloring can induce a kind of 'flow,' or active meditation, during which you lose your sense of time and your brain waves fall into a calming rhythm. As a result, worries fade away and creative blocks can become wellsprings of ideas. I am a true believer that what you think about comes about and what you focus on in your life expands. So, as you read these quotes by and about some amazing people, let them remind you of how amazing you are, and how you can use your unique gifts to make each day the best it can be. You'll also find ideas below about how to customize the mandalas by embellishing them with your favorite quotes or phrases—in this way, each mandala can become a visual representation of something meaningful to you. it's essential. Think of any time you could reclaim during your day by doing something nourishing for your heart—perhaps you could try it the next time you're sitting at the coffee shop waiting for your latte or while sitting on the couch in the evening instead of channel-surfing. Many people like to color at the end of the day as a way to unwind and set an intention for the day to come. Just like the spaces in this book waiting to be filled with colors, every day is a blank canvas waiting to be filled with life. We hope you enjoy this book and find that it helps you to color your world a brighter and happier place. The word mandala means 'sacred circle' in Sanskrit. Since ancient times, holy people from many traditions around the world have used mandalas as a way of evoking spiritual energy and healing. Mandalas symbolize wholeness, unity, and the cycle of life, and they appear in nature in many forms, such as flowers, snowflakes, and the sun and moon. The psychologist Carl Jung used mandalas as a healing tool, and research has shown that creating and coloring mandalas can relieve stress, reduce anxiety, and calm the mind. Each mandala in this book was specifically designed to help you turn your energy inward and instill a sense of peace and tranquility. At the end of the book, we invite you to create your own mandala, using the instructions as your guide. Each page is filled with details, which you can approach in many different ways. You can individually color each tiny shape, or you can group them together into bigger sections, which all come together to form a whole. You can leave parts blank for little pops of white space, experiment with color combinations, and play with different palettes, tones, and hues. TIP: Experienced colorists often add a piece of scrap paper under each page they are working on to make sure that the ink doesn't bleed through the page and so that they don't make indentations on the next page if they press hard or use very sharp pencils. It's a good trick to try! Colored pencils: great for shading or blending colors together, both of which add interest and depth to any design. Gel pens and markers: good for adding bold, defined bursts of color. Crayons: surprisingly versatile when filling in large spaces. The primary colors—red, yellow, and blue cannot be created by mixing any other colors. The secondary colors—green, orange, and purple—are formed by mixing the primary colors. Yellow-orange, red-orange, red-purple, blue-purple, blue-green, and yellow-green make up the tertiary colors. These colors are formed by mixing a primary color with a secondary color. The colors on the top half of a color wheel are considered the warmer colors whereas the bottom hues are the cooler ones. Colors that fall opposite of one another on the wheel are complementary, and the ones that fall next to each other are analogous. You can use both complementary and analogous colors to make a gorgeous piece of art—the possibilities are as endless as your imagination. Orange: creativity, productivity, optimism, and expressiveness. Yellow: happiness, lightness, humor, and fun. Red: vitality and increased energy. Green: renewal, health, and oneness with nature. Despite these nuances, there are no wrong colors. It is your book. Color it your way. ©2006 HCI Books. All rights reserved. 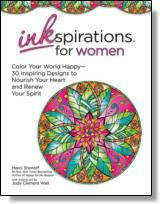 Reprinted from Inkspirations for Women: Color Your World Happy--30 Inspiring Designs to Nourish Your Heart and Renew Your Spirit. No part of this publication may be reproduced, stored in a retrieval system or transmitted in any form or by any means, without the written permission of the publisher. Publisher: Health Communications, Inc., 3201 SW 15th Street, Deerfield Beach, FL 33442.